Granny is a reminiscence of childhood. Pure natural wool from sheep bred on green alpine pastures in the remote valleys of the Tyrol the harsh climate and the rough terrain is home to high quality handcrafted production rather than the industrial. Each lamp can be tracked back to the flock where the wool came from. Intervention at different stages of the cycle has refined the existing products and new products were developed from half-finished materials. For “Granny” thick woollen threads are used to produce a raw yet cosy surface. 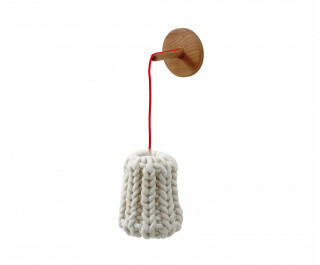 The threads are produced by a family business in the Tyrol, with each lamp hand-knitted by a collective of homebased workers in the Netherlands. A natural treatment is applied, making the wool flame resistant and resistant to moth and mite infestation.